Led by the Minister of Foreign Affairs, Dr Saad Ali Shire, a delegation from Somaliland met with cabinet officials from the Egyptian Government on 29 August, to discuss how to strengthen various aspects of mutual policies. Mr Shire and Dr. Samih Shukri, Egyptian Foreign Minister, discussed in particular how the two countries could to strengthen trade, education and health sector ties in the coming years. 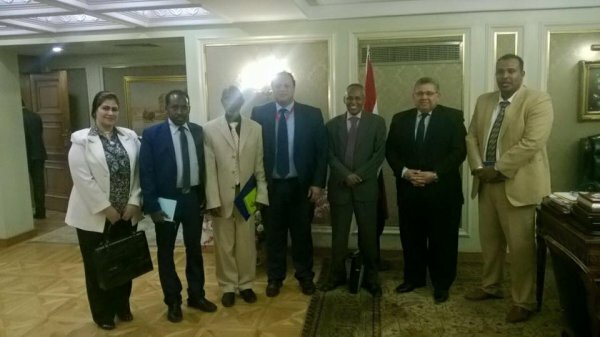 A delegation from Somaliland led by the Minister of Foreign Affairs, Dr Saad Ali Shire travelled to Cairo to meet with a number of Senior Cabinet officials from the Egyptian Government. The Minister received a warm welcome from the Foreign Minister of Egypt Dr. Samih Shukri, Minister of Higher Education Dr. Ashraf M. El-Shihy, Deputy Minister of Health, Deputy President of Al Azhar Sharef, MP and Chairman of the African Affairs Committee and held discussions on how to strengthen trade, education and health sector ties between the two countries. The discussions should pave the way for Somaliland to receive increased technical assistance and support from Egypt. The Egyptian Ministry of Education will provide up to 50 scholarships a year to citizens of Somaliland and has pledged to provide training for and increase the number of teachers in Somaliland. The Ministry of Education also agreed to collaborate in supporting research centres at University of Hargeisa. The Egyptian Ministry of Health, which yearly sends a team of surgical doctors to the Republic of Somaliland, has promised to maintain the number of surgical doctors in Somaliland and will also donate medical supplies and improve cooperation with their Ministry of Health counterparts in Somaliland. The Egyptian government is also sending a team of evaluators to assess whether there are any gaps in terms of religious education and to explore the possible building of mosques.